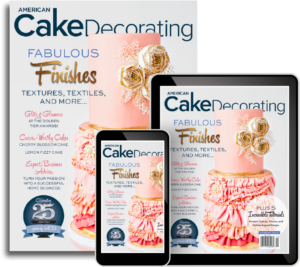 This month American Cake Decorating explores the dark and illuminating beauty of Alex Narramore’s painted cake in our Story of a Cake feature. We talk with cake creator, Alex Narramore of The Mischief Maker cakes to learn more about her incredible introduction to the wonderful world of cake, and discover the secrets behind her jaw-dropping creations. How did you get into cake making? At that time, I was in a basic art course in college, and I found that it was a good way to channel my newly sparked interest in art into a future career. My grandmother always cooked for everyone, for the whole town essentially, and I knew that food was something that people both appreciated and respected. My parents were always involved creatively in the community doing everything from large fundraisers/parties, windows, and floats. I was used to creative projects and always being involved in them. It was a collision of ideas that brought me to the conclusion that cake was my calling. I researched heavily, and the first cake I ever made was for my friend. It was a three tiered fondant covered birthday cake. Never one to start small, with layer cakes and move forward, I wanted to jump right into the heavy materials and concepts. While it wasn’t as elaborate or finished as our creations now, it stood, and it was covered in fondant semi-decently, and made it to its recipient. I’ve always believed in jumping right into what you want to do and aiming for what you want the cakes to “eventually” look like in the future. I decided what I wanted to do one day, which was to have a career with cakes, and that was that. Everything from then on out was about moving forward and progressing with that goal. 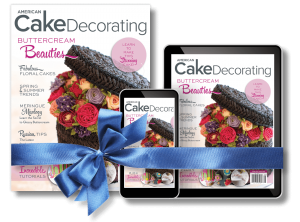 What training/education have you received (if any) as a cake maker? While I do have a background in art, I am entirely self-taught with cakes. Armed with lots of reading materials and a family cake recipe, I chose an excellent time to develop this burgeoning interest. The Internet was finally coming into its own and was bustling with information. TV was beginning to be saturated with so many cake related reality TV shows, which I would watch and only somewhat understand vs. now. At that time, there were (and there still are) forum spaces, and I could always be found with bags and bags of cake books that I took everywhere with me. In general, I love the idea of organic sugar florals, and movement; growing on top and over an otherwise very crisp and very geometric shape. I’m drawn to designs that look as if they live and breathe on their own accord. As an aesthetic, I am very intrigued by contemporary shapes and order, but I am simultaneously obsessed with life taking hold of things and presenting that counterbalance of “disorder” and representation of life; living breathing arrangements doing as they wish to do. I love to execute designs with very energizing and mentally activating color palettes. This is very important to me. I would most certainly describe myself as a colorist, and I take a lot of pride in making sure each and every shade seems “alive” and active. I like dimensionality in my arrangements, variety in texture, etc. I’m very drawn to whimsical thoughts and concepts, however, I am a firm believer in clients inspiring projects and versatility, and I feel you can put your own perspective and voice to anything. They provide me constant interest and inspiration, trying to bring their dreams to reality in a unique way that also reflects my own aesthetic is a way to keep oneself constantly evolving. Yes, they really are made of sugar! Gorgeous Foxglove Sugar flowers. Nature has wonderful inspiration. Such fascinating flowers and colors are already in existence; we merely try to create something that is perfect to begin with! There is inspiration everywhere. I love any interesting imagery and art. I’m enamored with with a fascinating color palettes and I’m always on the watch for something I feel has been combined together in a very unusual way that somehow works, anything that makes me take pause and think about something in a new way! I also like executing these concepts and color palettes myself. Do you have any formal arts training- painting/sculpture etc? Yes. I went to school and majored in Studio Arts in college. I also had a minor in Art History before switching schools, because at one point Deron, my fiancé, got into law school in a different part of the state. It was an education curriculum based around lots of art history, writing critique and analysis, some painting, sculpture, art and design principles etc. Serenely Beautiful, sugar orchid cake. What was different about this particular project, compared to other cakes you have worked on? This cake required lots of discipline and pre-planning. I don’t usually do any hand-painting, and it is the only hand painted cake in my portfolio. Coming from a specialization in sugar flowers and not hand painting, I definitely wanted an exact guide to go by. That guide was a sketch! I sketch all of my designs. Sometimes I leave room for leeway on my organic sugar flower arrangements, as those are usually arranged within 1-2 hours at the venue itself. This is not a design where I wanted any wiggle room. I’ve decided, if it looks good on paper, it will look good in real life! The sketch was a challenge, because it had to be redrafted several times. We had to map out the color placement/progression and placement of the sugar flowers themselves, so they didn’t take away from the background, hand painted poppies of the same variety. There were a lot of elements to consider and make cohesive. We also completed several dummy tiers for practice before moving on to the real cake. Marvelously Modern- Beautiful Black and White cake with pop of color. To continue to evolve, grow, learn, and continue striving for a unique perspective and interpretation with every cake we make.